Fast growing care home operator, New Care, is adding extra ‘oomph’ to its already outstanding daily wellbeing and activities programmes. The forward thinking care provider has teamed up with us to enhance mental, physical and emotional wellbeing. All New Care homes now have a number of specially trained in-house Oomphers who deliver the complete Oomph! programme for residents including exercise classes, one-to-one sessions and regular meaningful days out. Offering many benefits including a reduction in isolation and improved social interaction, mental stimulation and physical mobility, the programme has been exceptionally well received and is now a firm favourite with residents in all homes, who look forward to the daily and weekly classes and exciting excursions. Chief operating officer at New Care, Cath Fairhurst, commented: “Oomph! is all about making the residents happy and providing them with enjoyment and opportunities to socialise while promoting health and wellbeing. Our residents look forward to the Oomph! sessions and we usually have a full room for every class. Oomph! are partnering with professional bodies for volleyball, weightlifting, orienteering and boccia to bring healthy competition to over 55s. 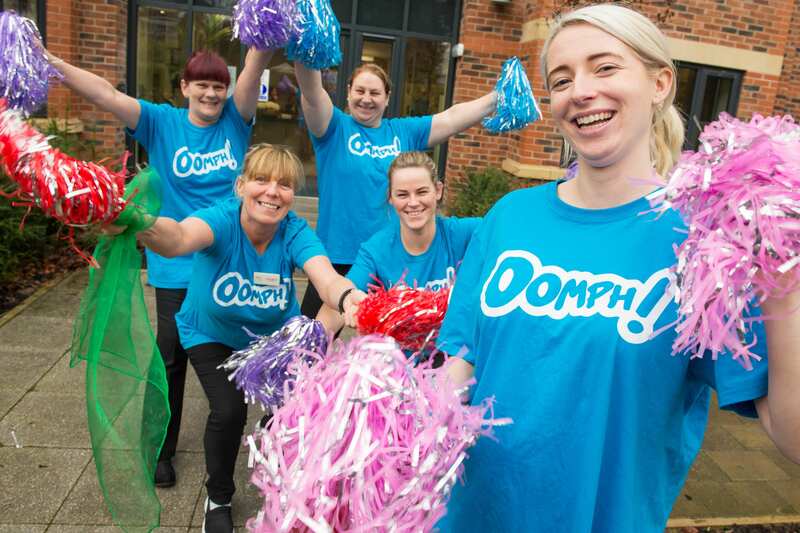 The national governing bodies for volleyball, weight lifting, orienteering and boccia are today launching revamped versions of their games to attract over 55s to sport thanks to a ground-breaking partnership with Oomph!. We aim to tackle inactivity and loneliness with our national plan to get 27,000 older adults doing regular, fun exercise within two years. Training is already well underway for workers and volunteers in venues catering for independent older adults such as retirement villages and housing associations – equipping them with the skills, knowledge and adapted equipment to run sports classes with an element of healthy competition. Venues from Lancashire to Hertfordshire will start running modified sports classes this week. All activities have been designed to be run by instructors, who will undergo comprehensive training from Oomph!, and without expensive regulation equipment and facilities. Volleyball England has approved a fabric covered inflatable ball and bunting in place of an official net; British Weight Lifting has designed resistance exercises using foam pool noodles and recommends the use of everyday objects such as water bottles as hand weights; British Orienteering is helping venues to create walking (or marching) courses which use post boxes and other local landmarks as checkpoints and Boccia England has taken the principles of a Paralympic sport and modified them for older adult settings, for example by suggesting the use of bean bags in place of specialist bowling balls. Other sports’ National Governing Bodies are now in discussions with Oomph! about versioning their games for this growing demographic. Among the first providers to run Oomph! 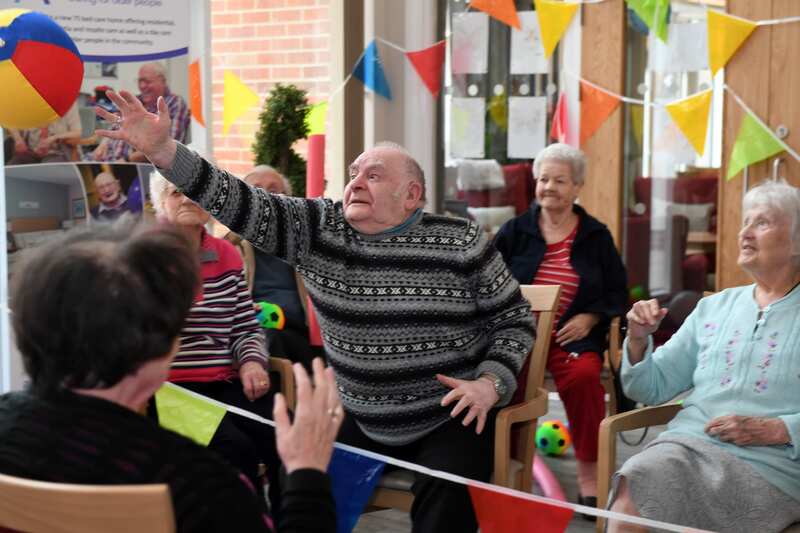 in the Community are Quantum, a retirement living provider, who are running the newly revamped sports classes in its daycare centres in Hertfordshire. Maria Ball, CEO of Quantum Care commented, “At Quantum Care we are always looking for new and exciting ways to encourage our day-care users and residents to stay healthy, active and full of fun. This is why we are so pleased to be partnering with Oomph! to train 48 members of the Quantum Care team to deliver exciting and impactful exercise sessions for older adults in Hertfordshire. “Once our staff complete their training we will be offering exercise sessions across 16 care homes and will be encouraging the local community to join us in our efforts to help keep the people we care for, and the people of Hertfordshire, active and healthy”. 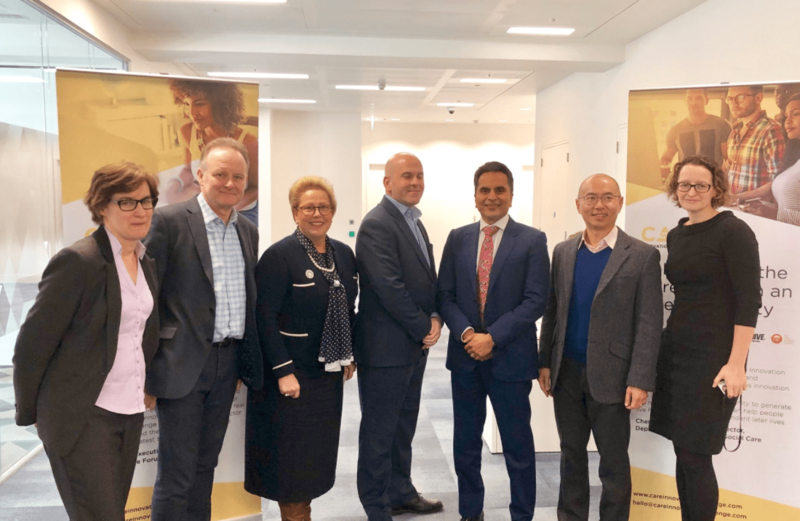 Hosted by the newly formed Department for Health and Social Care, Monday 19th March marked the final of the Care Innovation Challenge – a challenge created to bring young minds with new and innovative solutions to pre-defined sector challenges. Only a few months ago we (Ben Wilkins, Ashish Goyal, Alex Ramamurthy and myself) launched the challenge for the care sector. We hosted 20 University students for a hackathon weekend in February, put six teams through to the Final and supported those teams with mentorship for the 4 weeks leading up to the final. The CIC Final was held at the Department of Health and Social Care and Hassan Zaidi’s Tumble Alert (http://tumblealert.com/) was chosen as the winner by our expert panel of judges (Avnish Goyal, David Brindle, Charlotte Bright, Vic Rayner, Martin Jones, Annie Webber MHA Annie Webber, and Albert Chong). Hassan has now secured funding from UnLtd to launch his business. As a sector, social care has more employees and more beds than the NHS and provides the essential services and support to enable older adults in the UK to live independent, fulfilled and dignified lives but historically has struggled with the adoption of innovation. Often described as the valley of doom, the gap between ideation and market adoption is often just too big to bridge and many wonderful, life enhancing solutions never see the light of day. I hope that the Care Innovation Challenge will help bridge this gap. I wouldn’t pretend that I’m a specialist researcher – or an expert, or a regulator – but, as a relatively layperson, I expect to see a seismic shift as residents (and family members) entering the sector will expect a whole lot more from social care, driving the sector to an entirely new place. In my short time in the sector I have seen a lot of change (not always good), I have seen luxury care home providers grow exponentially, whilst also seeing the direct results of funding cuts in services which are mainly local authority funded – the gap between the two is frightening. Additionally there has been the launch of a multitude of different technology platforms promising to enhance care, reduce admin, care hours and costs. As the sector continues to develop, I foresee a convergence of the market with domiciliary care, day care, residential care and possibly sheltered housing becoming tightly integrated, often under one roof. I personally see this as one of the most exciting opportunities for disruptive change, ultimately leading to a person-centred approach, rather than a fragmented and disjointed experience. I hope, like many in the care sector, the work we are doing at Oomph! helps to ensure that everyone (regardless of setting) enjoys a ‘full life for life’.